Shield: polypropylene; Backing: EVA; Fixation+ankle guard: polyester. 3D flexible shield offers low-profile, maximum protection. EVA backing for optimal comfort and durable cushioning. Adjustable single-strap front closure. Attached ankle guard. Shinguard SizeS: 7", M: 8", L: 8.5", XL 9"
Special FeaturesHard shell and highly protective front plate for safety, detachable ankle protection. 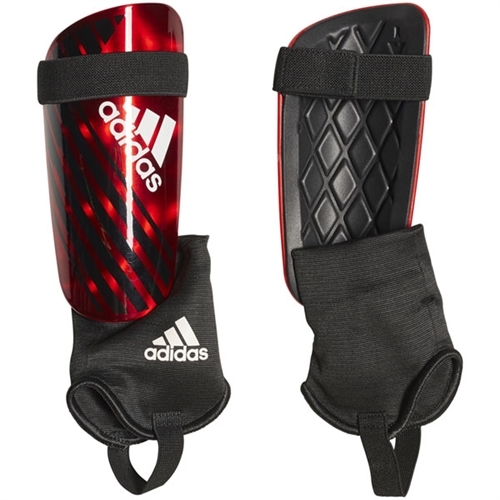 adidas adidas X Reflex Shin Guards - NOCSAE Approved are tough shields on these soccer shin guards curve two ways to perfectly fit your contours. The EVA backing adds cushioned comfort.